PathCAL is a series of online tutorials covering a wide range of pathology and pathophysiology subjects produced and published by the College of Medicine and Veterinary medicine at the University of Edinburgh. You have the option to search or browse tutorials, and it features a Tip of the day to highlight particular conditions. As you work through a tutorial there are opportunities to answer questions and quizzes to test your knowledge and learning – with feedback given as you work and when you reach the end of the module. Access PathCAL via the Library’s Databases page. ASSIA is a database available on the ProQuest search platform. It is designed to meet the information needs of the caring professions, and spans the literature of health, social services, psychology, sociology, economics, politics, race relations and education. The database abstracts and indexes over 500 journals, from more than 16 countries, and is updated monthly. There are a number of ways to search ASSIA including Advanced Search options, however, the default search option is the Basic Search making it very quick and easy to get started. When viewing your results selecting the Detailed view option will display the SFX@SGUL buttons for each entry – this enables you to check whether the fulltext article is available via St George’s. You can refine your results using the Narrow results by options to the left of your search results. There are also a number of options for managing your search results including emailing and printing available at the top right of the results page. To save results and searches or set up alerts you will need to register for a My Research account, which is free. For more information on searching using ProQuest there are a number of YouTube videos available that have been produced by ProQuest. Or alternatively, ProQuest have also produced an online guide, the ProQuest Platform Search Tips section is particularly useful. ASSIA can be accessed via the Library’s Databases pages. Citing and referencing correctly in most cases is not difficult – it just requires a bit of careful attention to detail, which can be time consuming and when your deadline is looming time is not always on your side. This is where using a reference management tool can help, enabling you to generate correctly formatted bibliographies (reference lists) in a quick and intuitive way. Here is a brief overview of a couple that are freely available online. These tools provide templates for a range of resource types (for example: books, journal articles, websites and many more), which you can use to either automatically import or manually input the details of the resources that you want to cite and reference in your assignment. When you have added all the resources you are using in your assignment you can generate a correctly formatted bibliography simply by choosing the referencing style you require, for example: Harvard – Cite Them Right, from the style menu. You can then copy and paste or export the bibliography to a Word document. 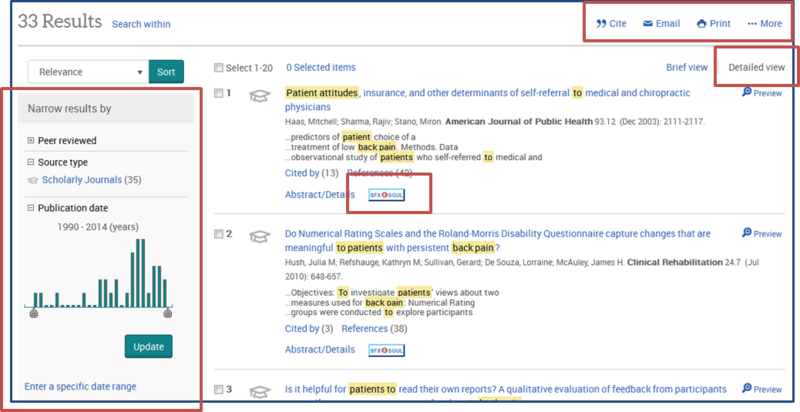 These tools also show you how your in-text citations should look in your chosen referencing style, and allow you to copy and paste these into your assignment too. + Very intuitive layout with clearly labelled functions so getting started is quick and easy. + No need to register for an account – your bibliography remains available for 7 days from when you first create it as long as you use the same computer and internet browser. + You can share your bibliography with a group if you are collaborating on a project. – The ‘Autocite’ feature available for books, journal articles and websites will sometimes miss key details needed to correctly reference sources imported this way, for this reason it is best to always choose the ‘Add manually’ option when adding your references. – To access full functionality requires an account, which you would need to pay for. – Without an account you can only create one bibliography at a time. + You can work on multiple projects at once, and copy/move references between different projects. + You can access your projects from anywhere that you can log-in to your account. – The automatic import function is fairly reliable, however, you should always check that the required details are all present and correct, and manually edit the reference if necessary. Be particularly careful with websites and books. – You can’t use RefMe without registering for an account, but accounts are free and quick to set up. – The interface is quite minimal, so you will need to spend a little time exploring where different functions are, but there are on-screen tips to help when you are getting started and once you know your way around it is easy to use. Both these tools have the potential to save you time when it comes to completing the citing and referencing in your assignments, leaving you more time to focus on writing your assignment. The University also subscribes to a reference management tool called RefWorks, on and offsite access requires a SGUL username and password. RefWorks is not as intuitive as these online tools but does offer additional functions that are particularly useful if you are undertaking longer pieces of written work. Links to all these resources are now provided on the Library’s Reference Management page. 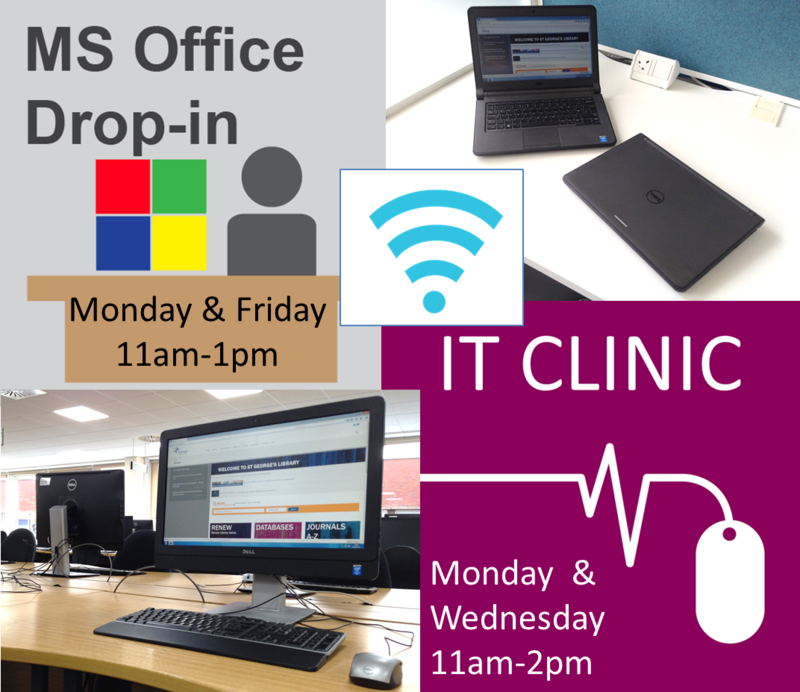 – And if you need any help, face-to-face IT and Microsoft Office support drop-in sessions take place in the Library Foyer. Microsoft Office support: Monday and Friday 11am – 1pm. After the trial of three key visual anatomy resources last year Acland’s Video Atlas of Human Anatomy proved the most popular and we are pleased to say we have now purchased this resource, read our blog post for more information. To make life that little bit easier we’ve put together a new online guide Library essentials to give you all the essential information about the Library in one place, from opening hours to connecting to the WiFi, and where to get help when you need it. And when it’s time for those first assignments don’t forget Library StART (St George’s Assessment Resources Toolkit) is there to help you identify, find, access and evaluate the information you need to support your work. 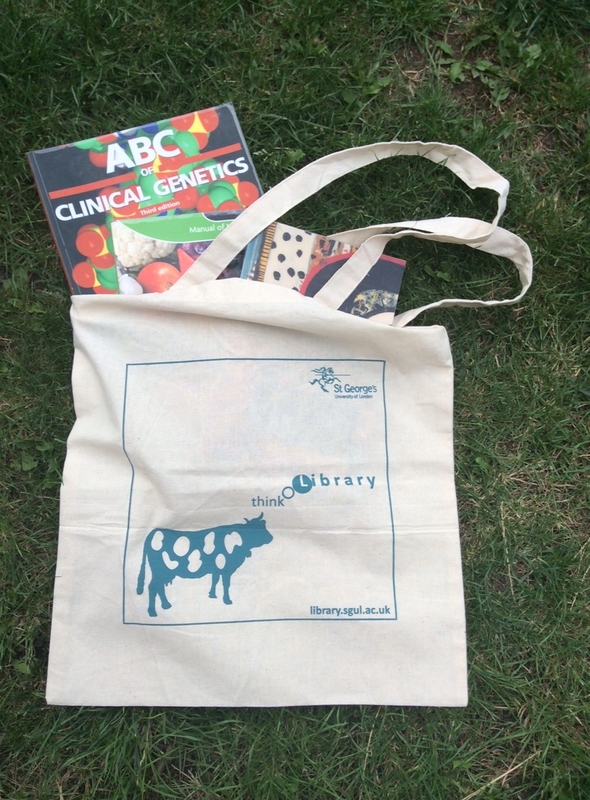 Also new for this year are tote bags honouring the Library’s most eminent resident, Blossom the cow. Get yours for £3 from the Helpdesk, or enter our Freshers’ Fayre competitions – Spot the Bull and Social Media Prize Draw – for the chance to win one. Look out for our stand at the Freshers’ Fayre on Monday 21st September. We’ve also created a Library Services Alert page to update you on any disruptions to Library Services. Earlier this year the Library ran a trial of three key visual anatomy resources. Acland’s Video Atlas of Human Anatomy proved the most popular and the Library has now purchased this resource. Specifically designed to support medical and dental students Acland’s Video Atlas of Human Anatomy is popular with both medical and non-medical users as an accessible source of anatomical knowledge featuring simple language and realistic, 3D visuals. For medical students this resource can be used as an adjunct to dissection and for reviewing learning, or to re-learn clinically relevant anatomy during surgical rotations. It is also a good resource for allied health students who don’t have access to dissection facilities, as the Video Atlas provides an appreciation of the real human body and a direct understanding of the mechanics of body movement. The videos are organised in 5 volumes: the upper extremity, the lower extremity, the trunk, the head and neck, and the internal organs. Exams are available for each volume so you can test your learning. To access the exams and save videos to your favourites you will need to register for a personal account. Acland’s Video Atlas of Human Anatomy can be accessed offsite or on your mobile or tablet if you sign in via Shibboleth using your SGUL username and password. To do this, select Sign in via: Shibboleth on the Acland’s homepage and then choose: ‘UK Access Management Federation’ from the Federation menu and ‘St George’s, University of London’ from the Institution menu, click select and enter your SGUL username and password when prompted. Acland’s Video Atlas of Human Anatomy can be accessed via the Library’s Databases page.